It's pronounced "cara-take-a." And the hit Apple II game is coming back this year. Jordan Mechner's best known for Prince of Persia, the platformer action game that became one of gaming's first independently developed hits. PoP went on to get sequels and a whole new re-imagining in 2003 that led to a multi-part franchise and eventually a blockbuster movie scripted by Mechner. But all the while, Mechner's first game—a hit in its own right—faded away into the fond remembrances of gamers of a certain age. Karateka put players in the role of a young karate master in feudal Japan trying to rescue his true love from an evil warlord. It was one of the earliest games that tried to channel martial arts combat into computer gameplay and ushered gamers into an eerily quiet landscape where losing any fight would send them back to the beginning. And a killer ending twist lay waiting for any player who bested all Karateka's opponents. That was all in 1985, though and Mechner knows that the Karateka of 2012 needs to be a different beast. The new Karateka is being made by a small team led by Mechner and is scheduled for release this year on Xbox Live and PlayStation Network. In an e-mail interview, the indie trailblazer talks about what will change in the updated version of his classic and what won't. Mechner also talks about recent indie games he admires and what old-school game he'd like to see resurrected. Kotaku: Why re-visit Karateka? Why not something new? Mechner: It's been eight years since my last game–-Prince of Persia: The Sands of Time in 2003—and in the meantime I've been busy writing movies, graphic novels, everything but games. Coming off of the Disney/Jerry Bruckheimer Prince of Persia movie, which was massive, I was really itching to get back to my indie roots and make something with a smaller team, and Karateka just seemed perfect for that. Unlike Prince of Persia, it's remained untouched for nearly 30 years. It's never been remade and there hasn't been a sequel. And yet people still remember it so fondly. I've gotten hundreds of messages from fans on my website and twitter asking about a new Karateka. It was my first game, the one that started it all for me, and I felt it really deserved to be revisited. Mechner: I made Karateka when I was in college, just discovering for the first time all those decades of cinema history I'd missed. I was obsessed with the films of Kurosawa — especially Seven Samurai, which is still near the top of my list of all-time greatest films. At the same time, I was discovering early Disney animation, and silent movies. I wanted to bring those film storytelling techniques to an Apple II computer game, which I saw as another new technology-based entertainment medium that was only beginning to tap into its storytelling potential, much as silent film had done a hundred years earlier. Japanese woodblock art was a great inspiration, the way artists like Hokusai created such a powerful mood and atmosphere with strong lines and just one or two colors. And the setting of feudal Japan was a straight homage to Kurosawa. But despite all these pretentious-sounding cultural references – remember, I was a sophomore in college at the time – under the hood, the story is straight out of an old 1970s Bruce Lee movie. And all of those things were also influences on the new Karateka. Mechner: Believe me, I gave it a lot of hard thought and tried to rationalize any number of variations before arriving at exactly the conclusion you just did: You can't surprise people twice the same way. So, not to spoil anything for people who may still be intending to play the original Apple II version… but that sudden-death ending that startled you in 1985, as well as the other game-ending booby traps you think you remember, will NOT be in the new Karateka. There are surprises, but they'll be new ones. I made Karateka when I was in college, just discovering for the first time all those decades of cinema history I'd missed. Kotaku: Your games are noted for the graceful fluidity of movement. Will you be revisiting any of the cinematic animation techniques that you used in the original Prince of Persia and Karateka? Mechner: It's funny for me, looking at the original Karateka now. It was hailed at the time as this great cinematic breakthrough, with smooth rotoscoped animation. And it's eight frames a second, with these giant chunky Apple II pixels, and it slows WAY down when that big first gate scrolls onto the screen. So, yeah, for the new Karateka, we knew we had to work on the animation a bit to meet modern standards. Kotaku: Karateka came out in a time when spoken dialogue was an exotic, technological feat in video games. Will this version be a silent affair as well? Mechner: Karateka is a silent movie. Adding spoken dialog or voiceover narration would be superfluous, and I think would have detracted from the emotional immediacy of the story. Just because you have the technology to add recorded speech doesn't always mean you should. The Artist is a case in point. By contrast, the sound effects track, environmental sounds and music are an incredibly rich and important part of the new Karateka. That's one area where I was really excited to push the envelope and go far beyond the original game. You have to remember that the Apple II could only play one note of music at a time – no chords – and every time I played a note or sound effect, I had to pause the animation on the screen until the sound was finished. That's one aspect of 1980s game technology I'm not particularly nostalgic about. Kotaku: The presentation of hand-to-hand combat in video games has changed since Karateka originally came out. Will you be employing a different approach—different camera angles, wounds or other signs of bodily damage—to express Karateka's martial arts experience? Mechner: Definitely, we've reinvented the combat gameplay mechanic for the new Karateka. The visuals and sound are much more dynamic and immersive. But it's very far from a brawler like Street Fighter. Even though Karateka has some claim to be considered the original martial arts game (it beat Karate Champ and Kung-Fu Master by a few months) and it could be thought of as a precursor to modern fighters like Tekken or Mortal Kombat, I don't really think of it as a fighting game. It's a cinematic, story-based game whose gameplay mechanic happens to be karate. It was important to me to keep things simple, and not get into the kind of fighting-game territory where it becomes about different moves and button combinations and inflicting different types of damage. It's a love story. Kotaku: Your blog makes you out to be a compulsive sketcher. Are you re-designing any of the visual elements of Karateka's world or characters for this new version? Mechner: All the visual elements are getting completely redone to take full advantage of modern day consoles. The stylistic inspirations are true to the original game – Kurosawa, Hokusai, Disney – but we've reinterpreted them to create a distinctive look for the new Karateka that's very different. Luckily, I'm working with a team of fantastic artists and animators, so I haven't needed to draw on my own limited sketching skills this time around – except for the occasional scribble-storyboard. You may have noticed on my blog that I can only draw people while they're right in front of me, say, in an airport or café. Take the model away and I'm helpless. After twenty years, I still can't even draw a decent Prince of Persia from memory. You can't surprise people twice the same way. What's easier about being an independent game designer in 2012? What's harder? Mechner: I'm actually doing a panel in a couple of weeks at GDC on that very subject along with Adam Saltsman (Canabalt), John Romero (Doom), Tim Sweeney (Epic), and Notch Persson (Minecraft), whose work spans the gamut from indie to triple-A and back again – much like the path I've followed with Prince of Persia and Karateka. I'm really looking forward to hearing about their experiences. The last few years have been an amazing renaissance for indie games, but as I think one of us wrote in the GDC session description, not all roads are paved with gold. There are so many incredible tools available to indie game developers today – first of all a little software application called the internet, which we didn't have in the 80s. Someone who wants to create the next big thing in his or her bedroom today can draw on an amazing range of tools and a truly global community of fellow game developers – a resource I could only have dreamed of in the Karateka days when my only source of programming tips and information about the industry was my monthly subscription to Softalk magazine. The flip side of that is, it's a lot harder to stand out when you're swimming in the same pool with hundreds of millions of people, rather than just thousands. Kotaku: What's different about corporate video game publishing now compared to the 1980s? Is it fairer to the designer or worse? 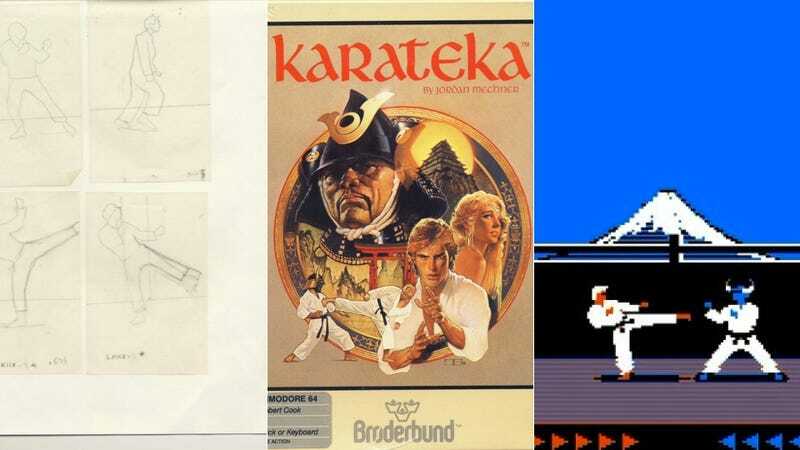 Mechner: When I look at the Karateka contract I signed with Broderbund in 1984, I don't know whether to laugh or cry. It's about three pages long, is written in plain English, allows me as the game creator to retain copyright and ownership, and was personally drafted by company founder Doug Carlston. I was nineteen years old and in college. No lawyers made a nickel on that deal. To say that in the past three decades the game industry has gotten more corporate is like saying the airline industry has grown more corporate since Kitty Hawk. But even in those early days, not every game designer's experience was as positive as mine was with Broderbund. (And if you read my old journals about the making of Prince of Persia, you can see that I spent almost as much time complaining about Broderbund's lack of marketing as I did coding.) So while the industry's growth has definitely tilted the balance of power toward big publishers, to be fair, game designers benefit when publishers invest tens and hundreds of millions of dollars in developing and marketing their titles. Prince of Persia became the global franchise it is today because Yves Guillemot believed in its potential and made a major bet on it. Anyone who's been in this industry thirty years will have had both positive and negative experiences. I've been fortunate – maybe unusually so — in that my experiences with publishers until now have been mostly positive, and I do feel I've been treated fairly. Kotaku: What game design trends over the last decade—say, since you had a hand in The Sands of Time—have surprised you? Are you going to incorporate any of them in the new version of Karateka? Mechner: It's a cliché to say that games are getting easier, but it's absolutely true. Players today expect controls that are not only intuitive, but much more forgiving and context-sensitive than in the past. Even in Sands of Time, in 2003, it was clear that modern console players no longer considered it fun to fall to their death just because they didn't press a button to grab a ledge, the way you had to in the original Prince of Persia. In 1984, Karateka gave you one life. No saves, no checkpoints. If you lost a fight or suffered a mishap, even if you were almost to the end of the game, you had to restart the whole game from the beginning. And much of the gameplay depended on the player toggling between running and fighting stance using a control scheme in which it was quite easy to make a mistake. We couldn't get away with that today. No one would tolerate it. So a major challenge in designing the new Karateka was how to make it less punishing and more inviting to play, by 2012 standards, yet still offer enough of a learning curve that players who like a tougher challenge will have something to sink their teeth into and really master. Many players cherish their memories of how good they felt when they finally beat the original Karateka, and it was important to me to honor that. The solution we found involves a new gameplay mechanic that's somewhat innovative, in its small way, and fits nicely with the story. I'm quite proud of it. Kotaku: What contemporary independent game creators do you admire? What do you appreciate about their work? Mechner: I've been very impressed by recent indie games like Braid and Limbo, for XBLA and PSN. They're works of art with great design integrity, that stand out despite their limited budgets because they've made strong and consistent creative choices. Elegance, artistic coherence and economy of means, are qualities I always look for in a game – in anything, for that matter – and sometimes you can find them in a smaller game, not just the bigger triple-A titles that impress with more overtly amazing technology and content. Kotaku: What other releases from your fellow designers from the Karateka generation would you like to see revisited for the present-day? I want Bill Budge's Pinball Construction Set as an iOS app. Has someone made that already? They should! Kotaku: Your memoir let readers into your head when you were working on Prince of Persia What would the Jordan Mechner of 2012 tell his 18-year-old counterpart if you got bathed in a waterfall of magic time-shifting sand? Mechner: Don't worry so much about obsessively maintaining your vinyl record collection. You won't need it as long as you think you will. And senior year, when the Karateka royalties start coming in, buy shares in two little companies called Microsoft and Apple.